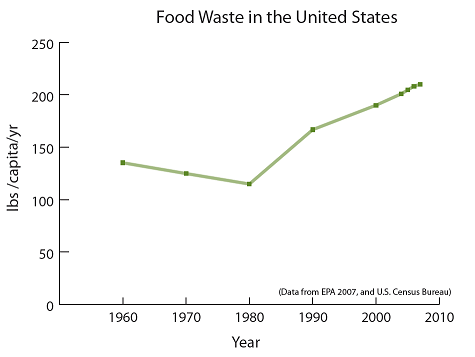 Food waste and human excrement are everywhere that people are. Whether you are in a major U.S. city or a developing country the handling of these waste streams is critical to human health and disposing of it only becomes more challenging as cities grow. Anaerobic digestion is an established technology used to treat these waste streams, and has the added benefit methane gas production. Unfortunately, the low value of methane ($0.06 per pound) has led to it’s waste rather than usefulness. More than 67% of the gas produced from anaerobic digesters in the United States is flared; releasing greenhouse gases but contributing nothing to our energy supply (BlueTechResearch). Furthermore, the long retention times needed to produce the methane increases the size of digesters and makes the process unaffordable for smaller communities. My focus is on producing higher value chemicals from food waste and human excrement which can reduce waste and provide an economic resource to communities. 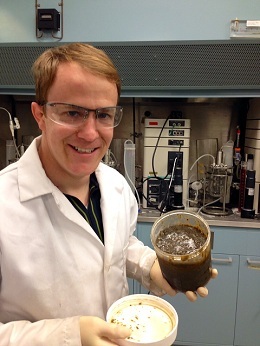 I am altering the conditions of digesters to produce valuable chemicals instead of methane. These bio-based chemicals include lactic acid, acetic acid, propionic acid, and butyric acid(Batstone et al. 2002). All of these chemicals can be degraded by microorganisms if accidently released to the environment and they all have demand in existing markets. These chemicals can be used to create biodegradable plastics, organic herbicides and pesticides, pharmaceuticals, industrial solvents, and fuels and this makes them worth much more than methane. The current demand for these chemicals is being fulfilled by fossil fuels, which are extracted far away from where they are consumed. Foodwaste and human excrement could not only be a renewable source for these chemicals, but they would be produced near centers of consumption. The best part is that these acids are also produced with much shorter digestion times, and can be produced from much more concentrated waste streams. This could greatly reduce the size of digesters and make the technology affordable to smaller communities. When people ask about what I do, I typically start off with a poop joke. It helps break the ice to talk about something that to me is very fundamental. No matter who or where you are you definitely are producing excrement and you probably have some food that goes bad. If we can realize the value in these things we can give every community on the planet access to an economic resource. The fact that these chemicals are building blocks for so many different products means that deriving them from basic waste sources also makes them a building block for equality and sustainability. I would like to usher these technologies from the lab, to prototypes, all the way to deployment in developed and developing economies. I am particularly excited about pairing this technology with 3D printing to develop a drop in system that could use food waste and excrement to produce biodegradable plastic products of any size and shape, on demand.